Whoooooo loves owls like I do? My favorite baby hooded towel is still my owl and I just can’t stop wanting to make owl things. They are super trendy right now and very cute for things like….baby showers! 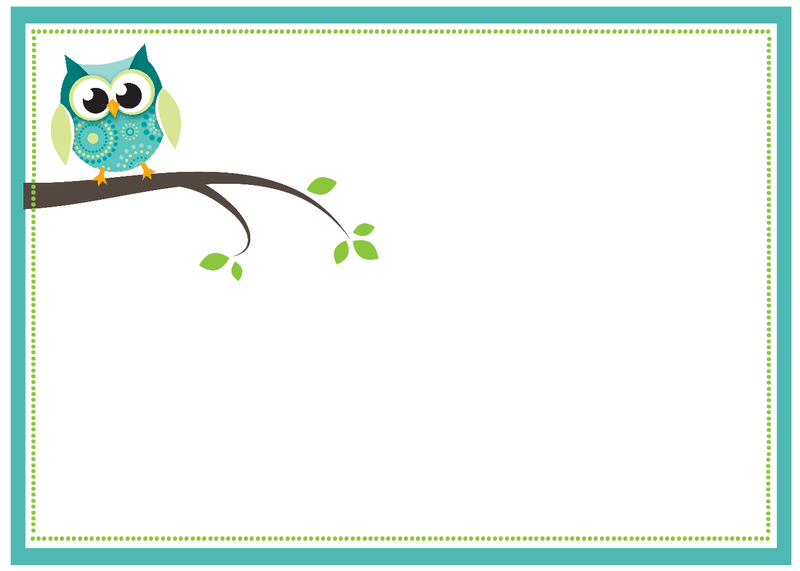 So how about some Free Printable Owl Baby Shower Invitations? You can use these and personalize them to make them your own! I have 4 versions of these owl baby shower invitations for you. Add your text and save. Then print. If you are using PicMonkey and need a tutorial on how to edit, I have some step by step help here. If you want to use the same fonts-here is what they are: (in the order that they appear in the sample above). To download these fonts go to http://www.dafont.com. They are all free to use. If you are editing in PicMonkey and want to use them, you will have to upgrade to their paid service, but it is only about $5. OK, here are the invitations. To use them, right click and save. Follow instructions above. I really appreciate that you have these free printables, but I am unable to print on the invitation without using a text box on Microsoft Word and when I print it out the text box is there. I have not been able to do in the Photo program. :/ Any suggestions? Hmmm, not sure. You can’t open it in a photo program? What kind of photo program did you use for this? I use paint shop pro. Good to know. I will pass that on to my readers. I’m hosting a shower for my sister and I could not find any invitations I liked until I came across your site. Thank you so much! Do you have this design for a thank you card? No, but I could. What would you want it to say? I also would love a thank you card design! so cute! what type of cards do you advise to print on? i was thinking of a smaller paper, but firm. I am having an enchanted forest baby shower for my daughter-in-law, who is having a boy. do you have any other suggestions that i could use to make it really special? I printed on card stock. You know, I honestly never felt like a creative person either. I was good at copying but not creating my own ideas. Starting this blog has helped me be so much more creative! 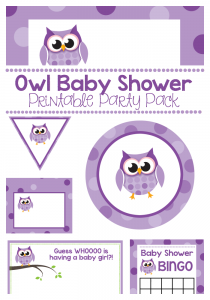 im using your owl printouts for my baby shower and so far they are fantastic! I love the owl theme and so far everyone involved adores them too. They print out well and look great im editing alot of them myself just on paint and its easy enough. Ive also used the address labels and edited them into name tags for everone coming ( its going to be a big one), im just looking now for more owl printables that i dont already have because i think im obsessed! Thankyou for putting these up here its made life so easy! I LOVE to hear this sort of thing. Thank you! These are adorable! I am doing an owl themed shower for my sister and the colors she picked for the baby’s room are teal and green, however she doesn’t know what she is having, she want’s to be surprised! Do you happen to have the invite where it doesn’t say boy? I could make one…what would you want it to say? What color pink and green did you use for the girl ones? Thank you for taking the time to not only create your owl template, but also to share. That was very generous and my sister will love the accessories for her owl-themed baby shower. I appreciate your generosity! Oh that could be cool. What colors would you want it in? Hey! I just downloaded a free trial Corel Paintshop Pro X5 and have NO IDEA how to use it! Could you give some pointers? How do you upload or save or transfer your printables to the program so that I can edit them and print them? And what size car stock do you usually use…4×6? Any hints you can give me I’d greatly appreciate it!! THANKS! Oh man, I’ve got to warn you that it’s a little overwhelming and I am no pro. You will probably want to save the printable to your computer, then open it in the program and then open a NEW blank image in the program and paste the printable as a new layer and then edit by adding more new layers. I wonder if you google if you can find some basic tutorials? I have been using it for years but it took me a long time to get the hang of it and I still don’t totally know what I am doing. When I open the image in Photoshop it’s so small- do you have a larger file size of this I could work with? It’s only 3.413×2.49 so that’s way tiny for an invitation. These are so cute I’m dying to use them! You need to click the image on my page to open it up to full size, then save and it should be fine. HI! LOVE these! I am able to edit them in Word. For those of you who want to get rid of the black line around the textbox in Word, just right click on the text box, choose to format the textbox, and choose the line color as white or “weight” as zero so no line appears. One question I have is whether the original .png file that I download is meant to be 4X6? It looks good on my screen but what size do you think would look optimal for printing? Thanks, you rock! I believe when I made those I did 5×7. I am using this invite for our daughter’s baby shower in Nov. Do you make a Thank you card?? In pink PLEASE.. Would love to see you add that to this!! Then maybe something about giving a book instead of a card.. I have seen this at A few other places.. I love GUESS WHOOO. Thank you!!! I’ll try to get one made. How can I write on the template to use and print on a blank invitation card? Save the file to your computer. Then open it in a photo editing program. If you don’t have one on your computer, try Pic Monkey online. You can add text as needed then. You can make your own cards / thank yous using this cute template – cut and paste into a word document (or other) and then use a TEXT BOX to cover or add you own wording. To get NO LINES, click “no color” for line color. It’s easy and there is no need for our ‘HOST’ to create something else – especially, if she is as busy as we are! Thank You for creating this for all to use – EXCELLENT! I absolutely adore these ideas! I’m helping to organise a shower for my friend who is crazy about owls so these are perfect, couldn’t find anything on the internet anywhere near as nice as yours! Thank you, Amber, for sharing your creativity! That is very considerate of you. These are simply adorable! I am having a Forest Friends themed baby shower for my little sister and I just printed the bingo card. It turned out perfect! What is the font that you used for Guess WHoooooos Having a Baby Boy? My sister is having a shower within a couple of weeks and in case she wants to change up the wording for that part but wants to keep the font, which is adorable by the way!, what font is that? P.S. This is a great invitation! She LOVES IT and so do I!!!! Just wanted to say thank you so much for sharing these wonderfully cute invites and printouts! I now have a theme for my daughters baby shower and everyone is loving the invites so far! So adorable! Thank you so much! Glad you are putting them to good use! Thank you thank you thank you!!! My sister is having a baby shower and she want owls and iv been going crazy trying to find boy owls! do you have this in purple and turquoise I am having owl theme with these colors to match babies room for my niece and this is last minute the shower is march 5 she was doing herself and I said no you aren’t suppose to give yourself one that it is supposed to be a surprise ill take over. any suggestions and help would be greatly appreciated!!!! I have it in purple. 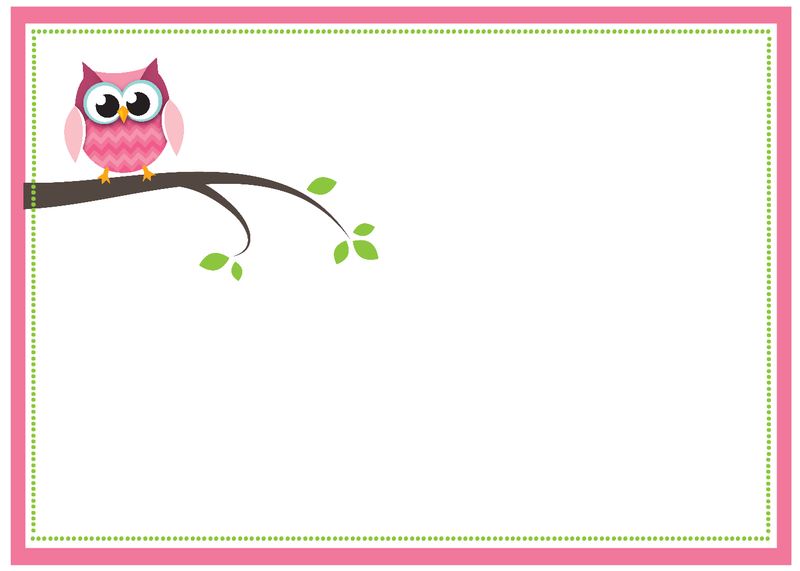 I used your owl invites as a background to my Name that Tune baby shower game I threw for my sister-in-law’s owl themed baby “sprinkle”. It was the perfect color combo to go with her nursery theme! Thank you for sharing these. My step daughter is having an owl themed nursery for her baby girl that is due in November. 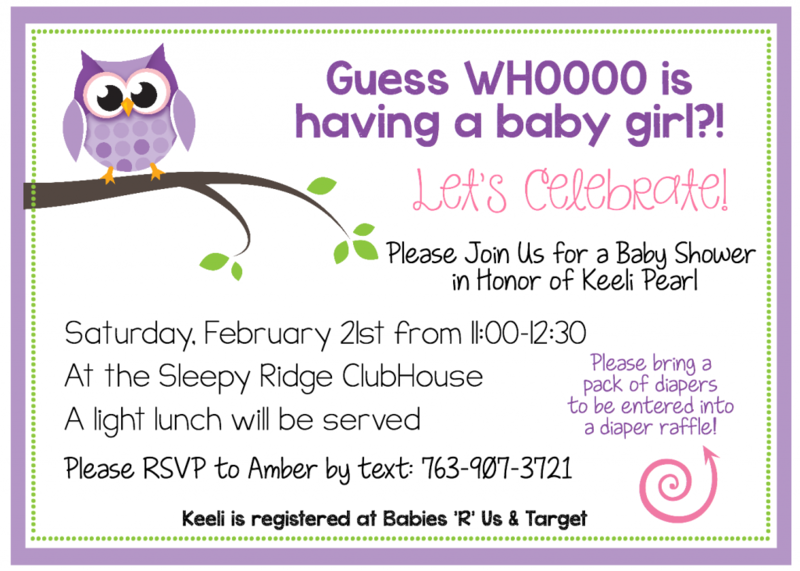 I am hosting a baby shower along with her husband’s mother and we love these templates. I was wondering, however, where you found that little swirl you used to bring attention to the diaper raffle. These are so cute! What are the color numbers for the pink invitations? Do you have a blank one in purple? Nevermind I found it! Sorry!